There are two terms you simply must hang onto in the event that you’re watching Jeopardy and “Art of Ancient Egypt” comes up as a column and pharaonic sculptures features in one of the answers: uraeaus and nemes. The nemes is the distinctive, striped headcloth donned by our Egyptian king here and probably best worn by King Tut himself—whose tomb treasures, coincidentally, featured in one of the most important exhibitions in SAM’s history: the 1978 Treasures of Tutankhamun. 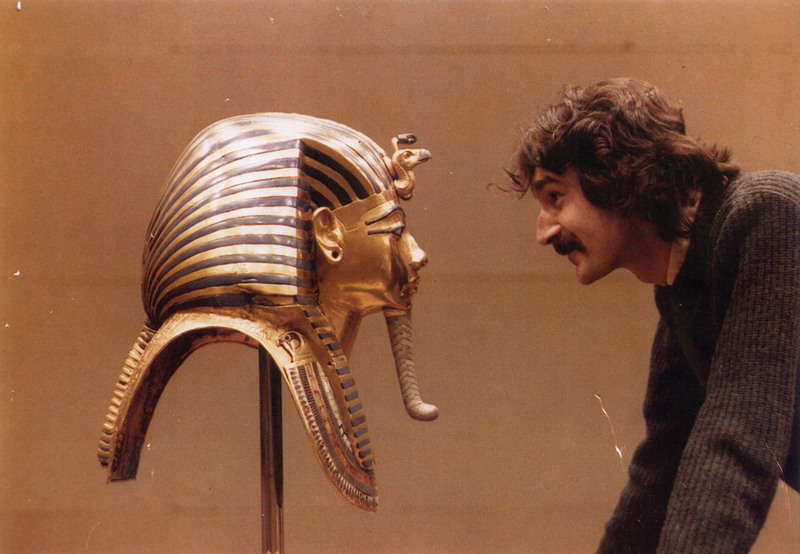 My personal all-time favorite photo from the SAM archives features our own Chris Manojlovic, Director of Exhibition Design, enraptured by Tut’s mask. The other term, uraeus, refers to the coiled cobra above the figure’s forehead, which was both a symbolic presence, signifying that its wearer was royalty, and a protective force, whose breath and venom would keep harm from coming to the king. 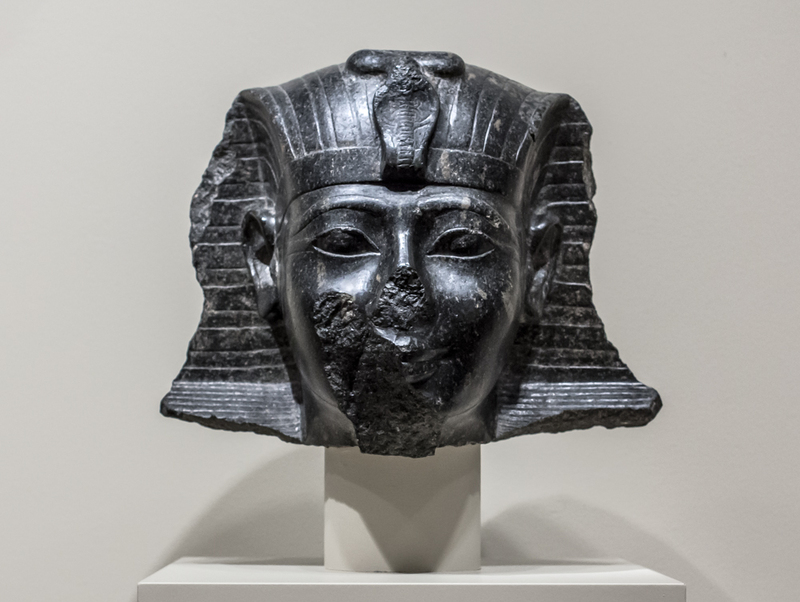 This cool Egyptian head lives amid our ancient art collection on the 4th floor downtown. S/he has had a long and interesting journey. The Egyptian artist(s) who crafted it worked with simple saws and drills made of copper to carve out the head and a complete, life-size body that was once attached to it. When they had established the form, they created a smooth surface by using stone scrapers over the hard basalt. A lively first life for the statue might have included performance in rituals and standing guard in a festival or funerary temple. Dating ancient material like this piece is very tricky and relies mostly on judgments of style. SAM’s sculpture has a date of mid-15th century B.C., in 18th Dynasty Egypt (about 1543 B.C.-1292 B.C. ), but in the first years after it entered the museum’s collection, expert opinions placed it in the much later Ptolemaic period (305 B.C.-30 B.C.). Because ancient Egyptian art idealized individuals—aiming to show them as gods—even the subject is a matter of debate. We think it depicts Thutmosis III, but it’s possible that instead the face represents Queen Hatshepsut, the woman who totally stole his thunder, usurped his throne, and pushed him to the background for her more than 20 years of rule. 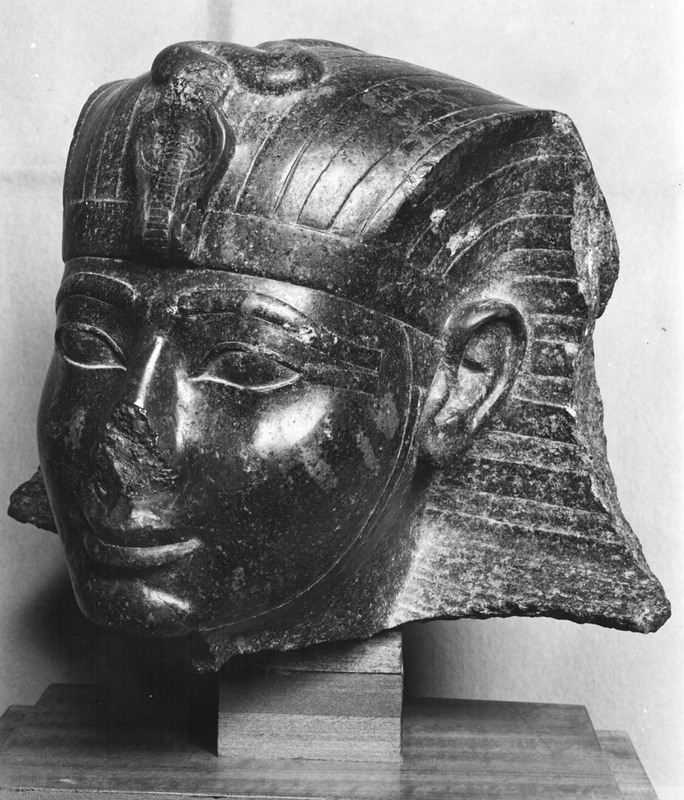 Our Head from a statue of Pharaoh Thutmosis III was cultivated from a 1937 excavation at the Temple of Armant in Egypt. Sir Robert Mond, pioneering chemist, collector, and archaeologist, financed the excavation, and notable archaeologist Oliver H. Myers directed the project. The basalt head was a highlight from their findings. Multiple restorations have the figure looking as good as s/he does now. Sections of the nose, cheek, uraeus, the upper lobe of the left ear, the upper and lower lobes of the right ear, and a segment of the headdress have been restored. One restoration, later reversed, is documented in the photo below, where simulations of the chin and right jaw are affixed to the original. For some time in 2002-2003, this striking sculpture joined Andy Warhol screenprints of Mick Jagger and Muhammad Ali, as well as Nigerian carved wood figures, for the SAM exhibition Hero/Antihero. Mounted at the same time as a show devoted to George Washington, Hero/Antihero explored the idea of the hero and the effect heroes have had on art and belief throughout history. The Egyptian pharaohs, each worshiped like or as God, offer a fascinating example of people venerating other people.